George Woods specialise in handcrafted timber products. 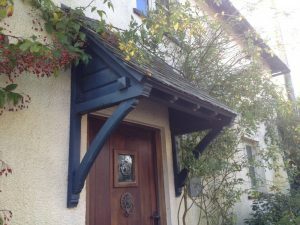 We manufacture door canopies, barge boards, finial posts and gallows brackets. Our door canopy range comes in many designs to suit the style of your property and improve the appearance of your house – from flat roof canopies to ‘A’ frame door canopies and mono pitch. Our canopies are suitable for front doors, porches and windows and are made from high quality timber by our highly skilled craftsmen. All door canopies are quick and easy to fix. If you are looking for something a little different from our standard range or just need to alter the dimensions please contact Sally and discuss your requirements, all bespoke designs are considered.